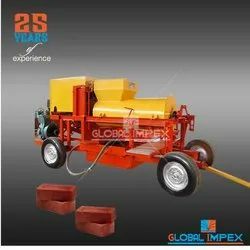 Providing you the best range of red brick making machine, clay brick making machine, global clay brick machine, red brick machine, clay brick machine and mud brick making machine with effective & timely delivery. We are involved in manufacturing and exporting a wide range of Global Clay Brick Machine to our most valued clients. Our clay brick making machine leverage high performance resulting in smooth construction of the material. Our range of Global Clay Brick Machine is widely appreciated by our clients which are situated all round the nation. We are involved in offering a wide range of Global Clay Brick Machine to our most valued clients. Our clay brick making machine leverage high performance resulting in smooth construction of the material. Our range of Automatic Soil Brick Machine is widely appreciated by our clients which are situated all round the nation. Looking for Clay Brick Machine ?